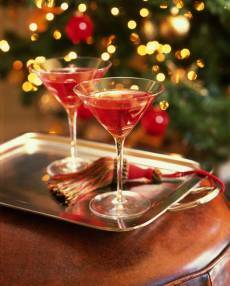 The traditional martini is given a holiday hue with a splash of cranberry juice. Shaking the ingredients vigorously in a cocktail shaker as instructed below helps to chill and blend the contents thoroughly. If desired, pomegranate juice or pomegranate syrup may be substituted for the cranberry juice. Also a very tasty drink. Put 4 martini glasses in the freezer to chill for at least 30 minutes. Just before serving, fill a cocktail shaker half full with ice. Pour in the vodka, vermouth and cranberry (or pomegranate) juice. Cover with the lid and shake vigorously up and down for about 10 seconds. Strain into the chilled glasses, dividing evenly. Garnish each glass with 2 frozen cranberries and a lemon twist. Serve immediately.